this is one Great Shower! 8 Jet Giessdorf shower heads. 3 Pounds of Solid Brass. Adjustable Spray. 24 inch Solid Brass Shower Slide Bar. 69 inch Deluxe Heavy Duty Stainless Hose. 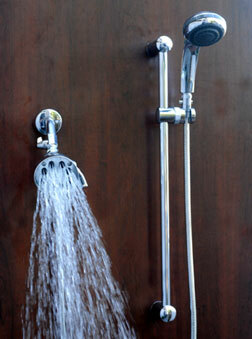 The Giessdorf 8 Jet shower headss will give you what many of our customers say is "the best shower I've ever had!"